Apparition of the Spider Princess Depicting Tsuchigumo (top right) Woodlock print by Yoshitoshi, 1887. 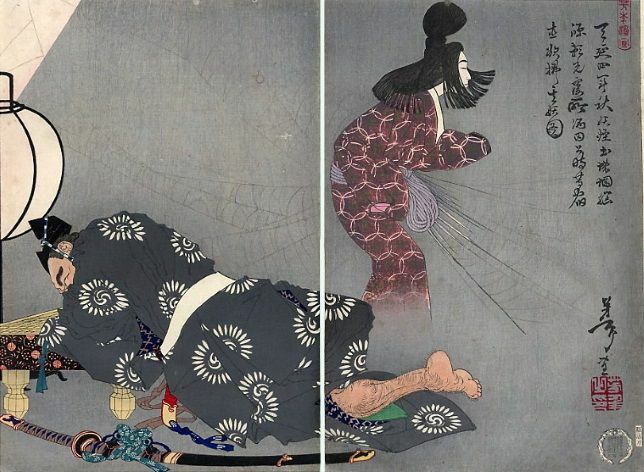 Japanese mythological spider figure is the Jorogumo ("prostitute spider") which is portrayed as being able to transform into a seductive woman. In some instances, the Jorōgumo attempts to seduce and perhaps marry passing samurai. In other instances she is venerated as a goddess dwelling in the Joren Falls who saves people from drowning. Her name also refers to a golden orb-spider species Nephila clavata (Jorō-gumo, or Jorō spider).